Grinda Shawl #2 – It's a T-Sweets day! Published on December 1, 2018 January 21, 2019 by Tracy @ It's a T-Sweets Day! Previous Virtual Cookie Exchange— You’ve Got to Try these Cookies!!! Next The Reindeer Have Landed!! That new one for your MIL is gorgeous, like Caribbean waves washing onto a beach of coral sand. So pretty! Absolutely stunning! And I *was* wishing I could see them both together! You will make the two moms so happy. 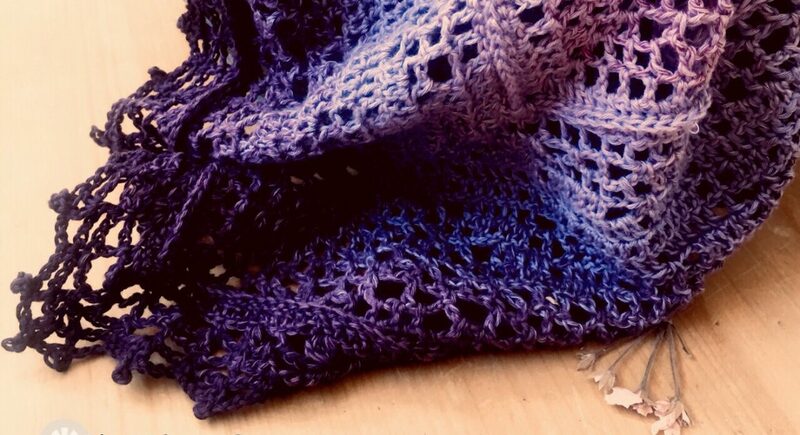 I was so excited to see the Grinda shawl heading in my in box, they are bot gorgeous and your ‘mom’s’ are going to be so thrilled to receive them. Get the camera ready for the reveal too! You have made my day! I’m glad to know that I am not overloading the internet with my love of crochet and quilting. You are the best!! Oh crafting goddess, those are wonderful! Thanks for the link to the free pattern!!! I like that name! We can be goddesses together Tierney:). I’m watching “The Amazing Race” now. How about you? Those are just so beautiful! The colors on both are amazing! Stunning gifts for some very special ladies! These are gorgeous – you chose lovely colours. lost if I don’t get it done in time to go under the tree.